The Brompton pannier solutions are very good, but what if you want to carry normal panniers or share luggage with other bikes? This pannier rack is the answer – it fits to the same front luggage block as the Brompton panniers and can hold two conventional front or rear panniers. It is made from one loop of 10mm stainless steel for strength. 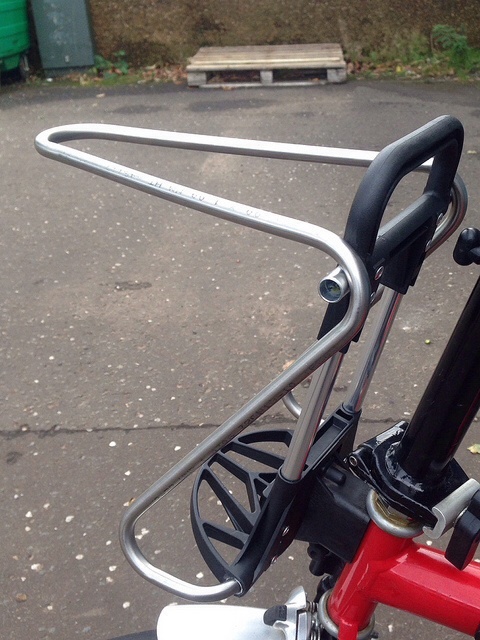 The handle lets you remove the rack and both panniers in one go. Yes, it’s the same height as the S-type bags. Hi, can you put standard bag same C Bag or T Bag Brompton on your frame kinetic ? No, my pannier rack is only for normal panniers, not Brompton bags – but of course you can unclip it and use a Brompton bag with its own frame. How does it feel to ride having so much weight at the front? I have a Travoy trailer attached to my Brompton so knows how it feels to drag a heavy load from the rear. I find the more weight on the front the better, it damps the steering, making it less lively. Yes, it still folds, though as with the Brompton bag it’s easier if it is unclipped before folding, and it depends how stuffed the bag is. With one pannier, it is very similar to having just one pannier on the back – A slight lean when you’re wheeling the bike, unnoticeable when riding. Would it be possible for you to fit/weld a bottle cage into the empty space in the centre of the pannier rack please? It wouldn’t be too hard to do that, sure. Please can you quote me for having a bottle cage fitted to the pannier rack? I’d like to order one. Hi. I have ortileb panniers. Will they fit to this? Yes, all modern panniers will fit. What’s the size of the ortlieb bags in photo? ,will there be problem using classic back rollers? I think those are back rollers in the photo. Will the weight of both panniers exceed the weight limit of 10kgs on the front mount? Depends what you put in the panniers 😉 I would recommend using front panniers, but the weight limit is quite conservative. I haven’t tried with those panniers, but it works with most rear panniers as long as they don’t extend too far above the hooks. to the rear rack(upwards) so that the height of normal panniers can be accommodated? I am looking for a solution to having rear panniers for touring. I have been experimenting with a rear rack design, yes – I just haven’t had the time to get it properly in to production yet! Is it possible to just purchase without the Brompton carrier frame assembly. I have a spare carrier frame and would like to just fit the pannier frame myself. If so how much would it cost for uk post. I’m afraid not – I modify the Brompton frame, it needs to have parts riveted and screwed in. Hi Ben, Is there enough clearance for it to work with P-type handlebars? 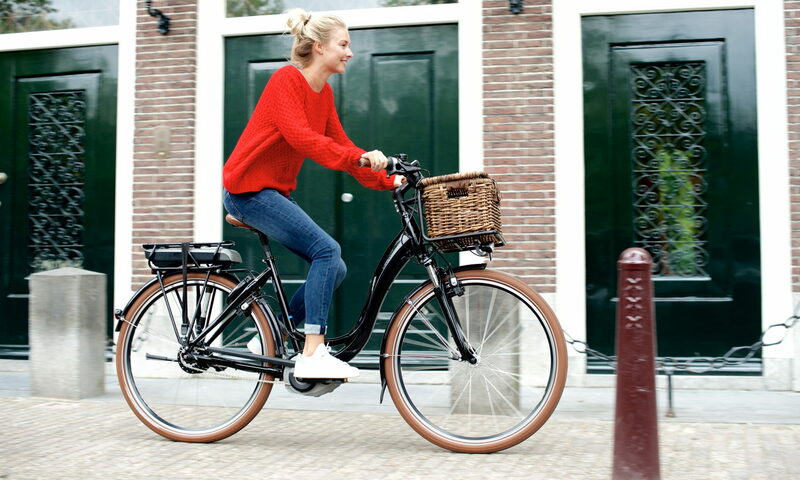 The rack is based on an s-type frame, so it has plenty of clearance – but of course it depends on the panniers you use.